So glad you could be here today for our first Garden Party of the season. Lots of things are blooming in my yard right now. Let me be honest though, it's a little raggedy because of our big pond project we are working on. When there's a project, other things get ignored. Right? 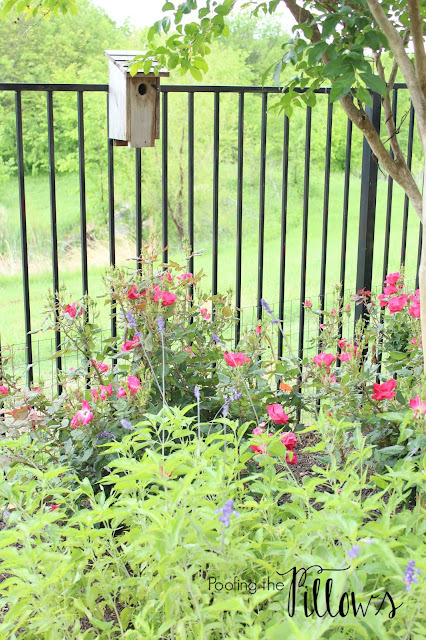 Let's start in the backyard where we have lots of Henry Duelberg Salvia mixed with Knockouts. Remember the pretty blue eggs I showed you in the bluebird house a few weeks ago? Those babies are already long gone and the mom and dad are on to the second batch. We love watching them so much. Maybe one of these days I'll get a photo of them. In the front yard, my yellow irises continue to bloom. The purple ones have completed their bloom cycle but the foliage is pretty almost year-round here in Texas. The irises came from my dad's old house. Right next to the irises, we have Autumn Joy Sedum which gets prettier every year and Loropetalum. 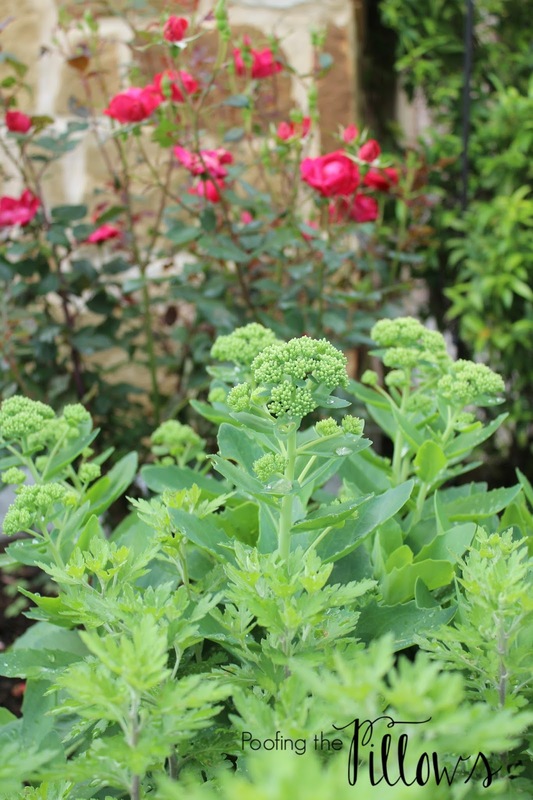 Autumn Joy Sedum is a drought tolerant succulent that looks beautiful all summer no matter how hot and dry it is. When it does have water you can see the leaves plump right up. The bees and butterflies are very attracted to it. The Anthony Waterer Spirea that we planted last year is blooming now for the first time. We had these bushes in Oklahoma too and I love them. They bloom forever and have a softness to them that most bushes don't have. house and it seems to be working. Now let's play a little game....do you know what this plant is? It gets huge white blossoms at dusk. The plant grows 4 or 5 feet tall. Can you guess? Want to see some older gardening posts? Check these out. Your garden is lovely Stacey! Thanks again for including us in this fabulous party. I can hardly wait to start visiting all of the wonderful links. There's no place I'd rather be than in the garden! Hopping back to bed for a bit, but tonight the visiting will begin. p.s. I would guess Moon flower, but the leaves really don't look like it. I so love your garden, my dearest Stacey ! I must confess to be overjoyed by linking my posts to this wonderful party, I adore gardening and gardens so much ! This is a fun party...thanks for hosting. Great party and beautiul flowers! Gorgeous in every way, Stacey! It'll be fun to see such loveliness -- especially when ours will be a bit in coming. (The best I could add to this party would be a walk through Mich. State's campus, which I plan to post this week!). To have this as your own garden! Sigh! And I love the foliage on seedum too -- it's good year-round! Stacey, I love gardening! Thanks for the party! Thank you for organizing our pretty party. It has been so enjoyable preparing for it and I can see that your gardens are very nurtured, colorful and thriving! I just bet they have enjoyed the rain and now the sunshine. Hello Stacey, your garden looks wonderful! Oh, what gorgeous flowers! This party is a lovely idea, and looking forward to the next one, I will take lots of photos when spring will arrive here. Thank you for hosting and happy gardening! 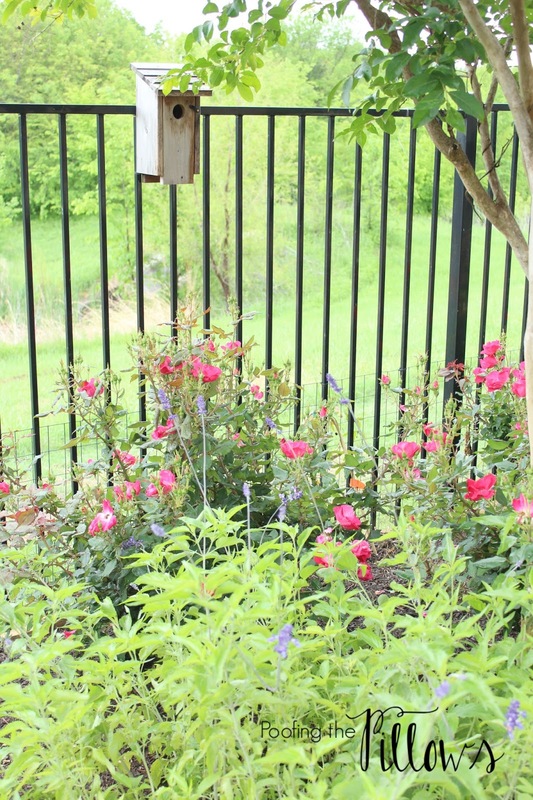 Stacy, your garden is anything but "raggedy" it is absolutely beautiful! Your knockouts mixed with the salvia next to the fence is gorgeous. Such pretty blooms for spring. Thanks for hosting. I wanna come to your garden party. Will you serve me tea? So beautiful, I am super excited to go with my mom this Friday on our annual outing where we hit tons of green houses and pick our annual Posies for the year!! ;-) You do an amazing job and obviously have a green thumb!! Thank you for hosting this garden party. I'm off to wander in the the gardens of Blogland. Your garden has some great plants with fun names. I can not even begin to guess what your mystery plant is. 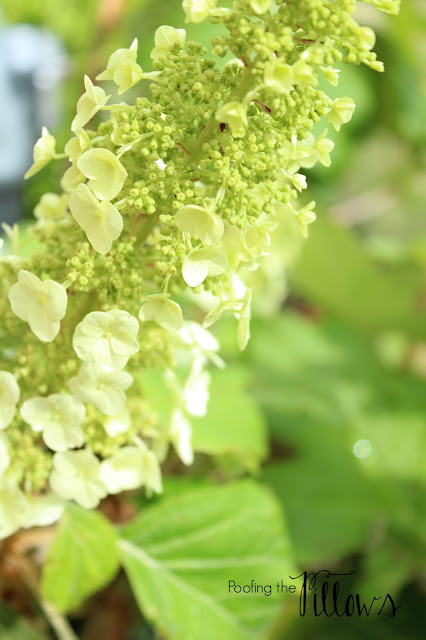 Love your Oak Leaf Hydrangea! I think I might have some Scabiosa in pots on my deck. 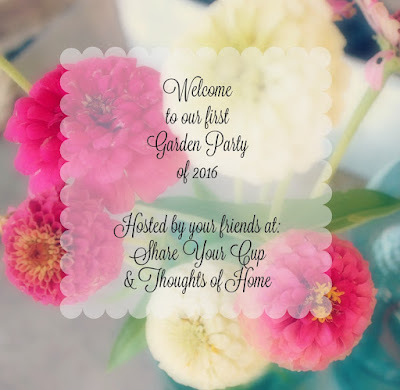 Thanks for hosting a link up to the Garden party! 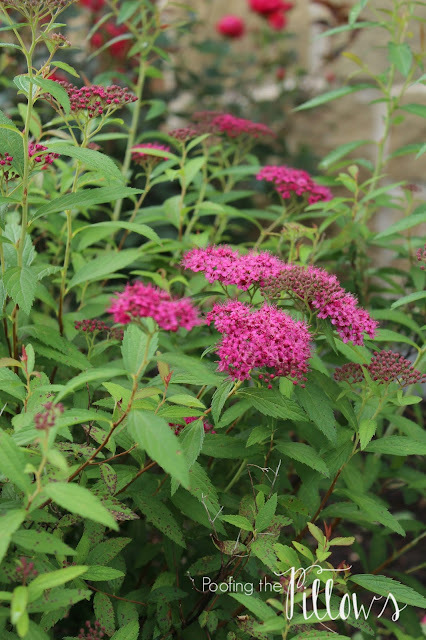 You have so many beautiful flowering plants in your yard! I have no idea what that last plant is though since it only blooms at dusk. I'm seeing a "Tobacco Plant" also know as a "Moon Flower" in your mystery photo! On Crooked Creektt is just South of Wichita, Kansas, dear one! Thanks for your visit today and sweet comment! So pretty! 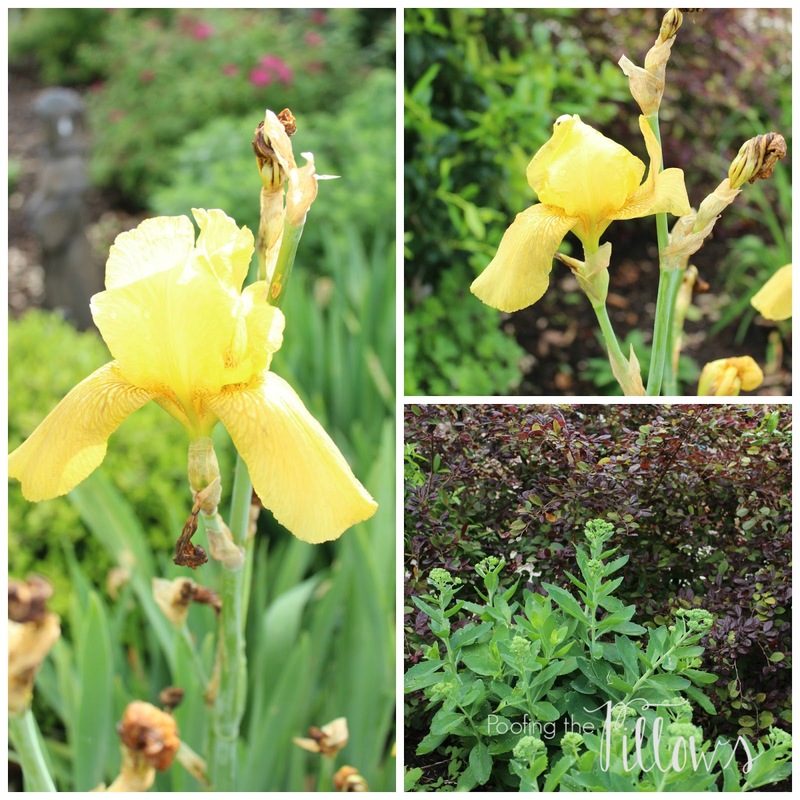 My mom took irises from my grandmother's garden and I always loved knowing their history. I should've taken a few for my own home, but I do have spearmint from my grandmother's garden!! Thank you for hosting ~ your garden is just lovely, Stacey! Thanks for stopping by! I hope you get to visit.. Have you been to charleston before? We love it here and dont plan on ever leaving! I also love reading everybodys blogs and learning so much about all the amazing areas of our nation and beyond. Your yard and flowers are gorgeous! Your yard is so beautiful with all the spring blooms. Love this time of year! Thanks for suggesting linking my daffodil post to the party! I hadn't thought of it! And extra thanks for your lovely comment! The garden party was a splendid idea. All gardeners love to see gardens. We can learn so much from each other and appreciate all the hard work that goes into a garden. Your flowers are beautiful. 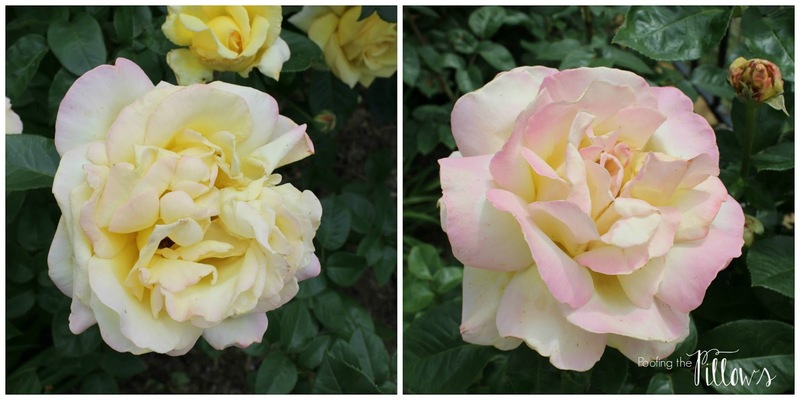 I adore the Peace rose. It does exude peace and smells so nice too. I had one at another house and enjoyed it. My garden now is mostly shade. I am hoping my hydrangeas will do better this year. The last two years has not been good. I had fungus and bugs. I like that the party lasts more than a few days. That is a plus for everyone to enjoy visiting and not be rushed. Maybe you have started a trend. I think we should slow down a bit and smell our roses. I dont garden but I enjoy looking at them!!! lovely! Your garden is stunning and I love all your plants. I think the mystery plant is a heirloom Nicotania plant. It has small white cluster trumpet flowers and smells wonderful at night. I could be wrong, but that's what it looks like. Take a leaf to the nursery and they can tell you what it is. 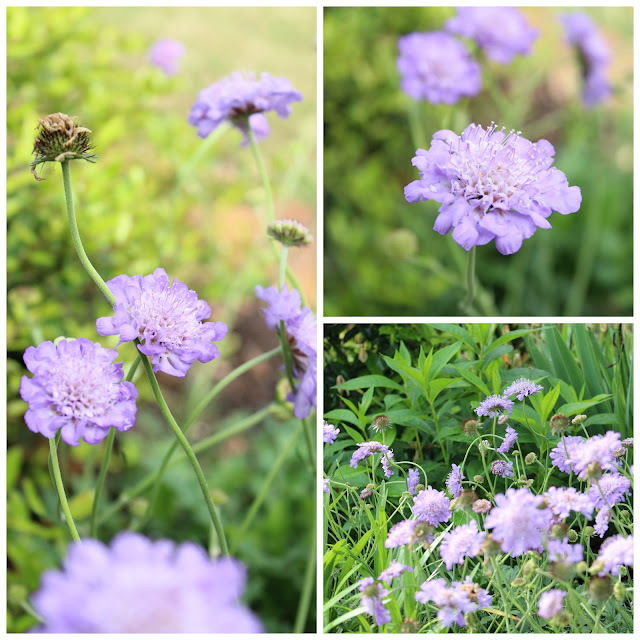 Scabiosa is one of my favorite flowers, and I often plant them in pots on my decks. How wonderful that you have irises from your dad's old house. My sister has been potting flowers from our mom's house so they can be transplanted here in Texas. Could it be an angel trumpet? Love all the gardens and the party! Stacey- i love that you have irises from your father's house. Gardening is that cycle of life, isn't it? you have always answered my questions- and then we laugh! I need some pincushion flowers. Your garden is lovely!! My perennials are just starting to pop up and it won't be unitl the beginning of June until everything is in full bloom!! Thanks for stopping by and for hosting the garden party!! Without looking at anyone else's comments I'm quite sure the mystery plant is Moon Flower! Loved seeing your garden post. You are so much further ahead than us. I tried the pincushion plant and it didn't come back. I was surprised it was sold here as a perennial since it didn't come back- perhaps I should try it again. When I'm outside doing things around my garden I find it hard to do anything indoors, but I love that. Makes your home seem so much more enjoyable when you come in after working outside like that. That peace Rose is a beauty. Thanks for hosting this party- I'll do my best to participate each week! Hi Stacey! Oh what fun, a garden party. I will try and get back here soon to share a few new bloomers in my yard. Our oakleaf is not blooming yet, but it is one of my favorite plants. Don't you just love how big the leaves get and the transitions of color the blooms go through. You have so many beautiful blooms in your yard. I fully understand how one project can leave so much else undone. I have been hopping from one project to another so much lately its crazy. I am happy to say some are finally coming together though. I cannot wait to see what you are doing with the pond. Thank you for hosting such a lovely party! Stacey, thanks for giving us the opportunity to enjoy such beautiful gardens! Here in Michigan, the daffodils are up! ha! I have a serious case of garden envy! But I am gathering inspiration from your beautiful garden and others! Hi Stacey... all these beautiful pics make me miss Texas. The Mister is taking Friday off so that we can plant our pots and window boxes. In the meantime, I will stroll through all these luscious links!! Enjoy your week! So nice to see all these colorful spring flowers! Thanks for hosting and enjoy your week! *Sigh* You're kind of killing me. My garden consists of some violets blooming and the tips of the hostas peeking out and hoping they don't get frozen. It DOES give me some hope for what I'll be seeing in a few weeks :) In the meantime, your garden is so lovely, to have roses blooming this time of year! Smell the roses for me ok? So gorgeous. I know when you get the pond done it will be the icing on your beautiful garden. Here in the Midwest we are just starting to see things begin to bloom. Hopefully in the next few weeks flowers will begin to appear. Can't wait to see your pond! Oh this is so lovely! I wish I didn't have a black thumb! This is totally one of my goals this year- learn to garden!!! Stacy, your garden is just delightful! Everywhere I look is just beautiful! And a pond, how wonderful that will be! I enjoyed the party, thanks for hosting! I so needed this today--we are covered in snow!!! Stacey, even with the pond project going on, your garden still looks lovely. 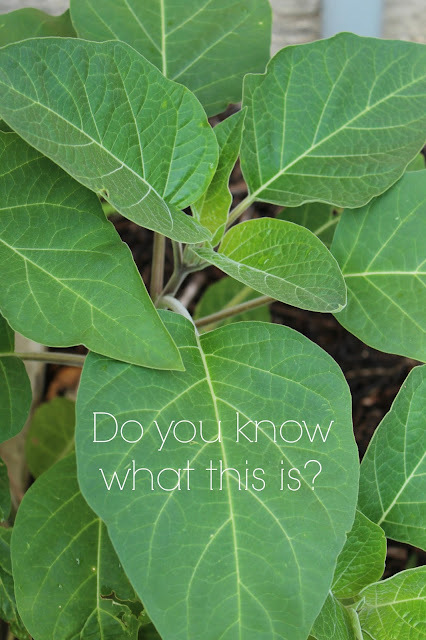 As for the mystery plant, we call it angel's trumpet. It's a beauty! Loving the Spring Garden party. Love everyone's pretty gardens. I love all the plants you have and will be adding them to my garden journal to see if I can fit some of them in this year. I am always looking for something new to plant. Your photos are gorgeous!! Garden season is my favorite season! I love all the blooms. Datura or moon flower is what I call the mystery plant. I have them all through my garden & love their night blooms & fragrance. I do like a nice garden party. Yours is beautiful. Stacy no matter where you are your garden is beautiful! I love the footage-y look of your space and all the variety and color. I know you will be so glad when you get your pond finished. Can't wait to see it! PS Thanks for the FB shoutout! Oh Stacey, you have so many plants to enjoy...love the roses, the pincushions, and the spirea are just gorgeous. I'm hoping to get some of the spirea to replace some knockout roses that are behind my waterfall. Someone said that they'd be a good replacement, but I'm wondering how tall they get. Thanks for hosting and have a happy week gardening! Beautiful flowers and plants...such a wonderful garden you have! You have such lovely gardens, Stacy. Where I live spring is erratic weather wise, and I can not plant anything till middle may at the earliest, so I really enjoy seeing gardens in bloom at this time. I love your sedum....I have a bunch and am on the hunt for one I read about, that is scented. You have worked so hard and your flowers are all lovely! I didn't read all of the answers, so this may be a repeat... Your plant is commonly known as Jimson Weed. Be carefull, it could take over a third world country in no time flat! It is so beautiful that I let it come up here and there, but it is really invasive and I apologize everytime I pull one up and toss it!